My name is Anja Bolbjerg and I’m a passionate skier. During my skiing career, I was told several times that I should forget about competitive skiing. At first because – when I started competing, I was so far behind, that some would say it wasn’t even funny. I loved it though – and I just wanted to get better at it. Later because of the injuries. It came to a point where I was more or less constantly injured for 3 years in a row! That was less fun… There was a lot of doubt and even fear. But getting back to skiing free of pain and feeling strong and able to express myself fully in the snow again, pulled me towards new guides who understood both my pain patterns and the physical demands of what I wanted to do. From there on I just had to train the right way. I have created Strong Skier to help other passionate skiers do the right kind of training, so that they too can enjoy skiing better and stronger and avoid feeling old, scared and un-fit – even after an injury. So, you wanna read my story…? I used to compete in moguls skiing for many years. I have been to 6 world championships and I have gone from being last every time (unless someone else crashed) to carrying the yellow world cup leader bib. Moguls skiing is a physically demanding sport. Your balance is constantly challenged and sometimes you have bad crashes. To get to world class level, being from a country with no mountains and starting fairly late in life, I had to push it. I was in Mont Tremblant at the first world cup after the Christmas break. I was wearing the yellow leader bib and I had just won my first world cup before Christmas. With one month to go to the 1998 Olympics I was now one of the favorites to win the Olympic gold medal.That would make me the first Danish athlete in history to have ever taken a medal at the Winter Olympic Games.I was really excited and ready to give it everything. My back was not feeling great, but I tried to ignore that. I felt like I had more important things to concentrate on. It wasn’t time for a break, I thought. I had to keep at it. This freezing cold January day in Mont Tremblant, the moguls were icy and hard like concrete and I just couldn’t stay warm. I sure had received all the warnings, yet I didn’t see it coming. All of a sudden my body told me in the most explicit manner: I have had enough! My body now told me in a way that I couldn’t ignore anymore by getting stuck so I simply couldn’t move! Discs in the lower back were bulging out and touching the nerve. The power of a dream got me ready to stand up and ski on pain killers for the Olympics – but my reflexes were rusty after one month of complete inactivity. The only movement I could do was a bit of training in the pool. AT the bottom of my run I got a little out of balance and didn’t recover so well. I placed 13 which I guess was somewhat of an achievement under the circumstances. I was so disappointed with the whole thing though. I had believed in it till it was over. I took the rest of the season off to recover but over the summer the bulging disc herniated with a sneeze! And there I was, imobilized again. I was prescribed ten visits to a local physio. As if that was going to help me be able to ski down icy moguls again…! You probably think – well how smart are you? Everyone knows that the body needs rest and that you have to listen to the alarms and act on the red flags! Yes, I know too – and I even knew then. But what I didn’t know was the connection between events. I didn’t understand that I was in a high risk group for this injury. Nor what I could have done to prevent it from happening. My approach to training was focused on gaining absolute strength – not on injury prevention. But with the repetitive movements and little traumas here and there, that were never properly assessed, muscular imbalances had developed in many significant places. That was the proce of not having a conditioning coach who understood moguls skiing. (In Denmark skiing is more associated with “after skiing” than with sports and we had never had any athletes aspiring to win medals, so there wasn’t much help to get as a skier). I struggled with back pain for a full year after this, making it impossible to get a good flow in the training. It was really frustrating. 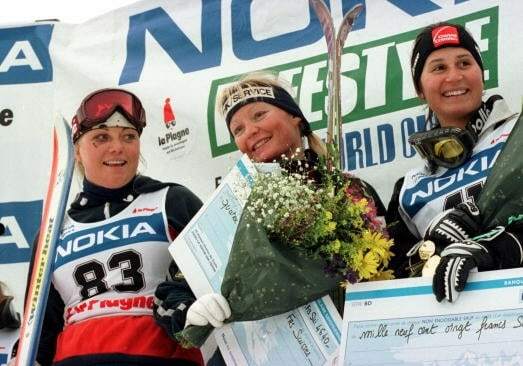 I managed to get a 7th place at 1999 World Championships – helped by the warm weather and very soft snow, but I couldn’t reach the top level from before the injury. After this I decided with my coach, that enough was enough. I had to find some people who could help me with this, who understood the demands of the sport. I also decided that I needed to know and understand for myself why my back didn’t get better. I didn’t have a team doctor since I was a one-person team. So I consulted with some of the doctors from the other teams at World Championships. The Canadian Team doctor, Dr Galea, told me that if I came to Toronto, he would fix me. -Isn’t that exactly what anybody in pain wants to hear! Going there almost cost me my funding from Denmark even though I paid for everything myself in Canada. (Political stuff. Some people didn’t appreciate me choosing my own solution, but with that 10x physio stunt I knew they couldn’t help). 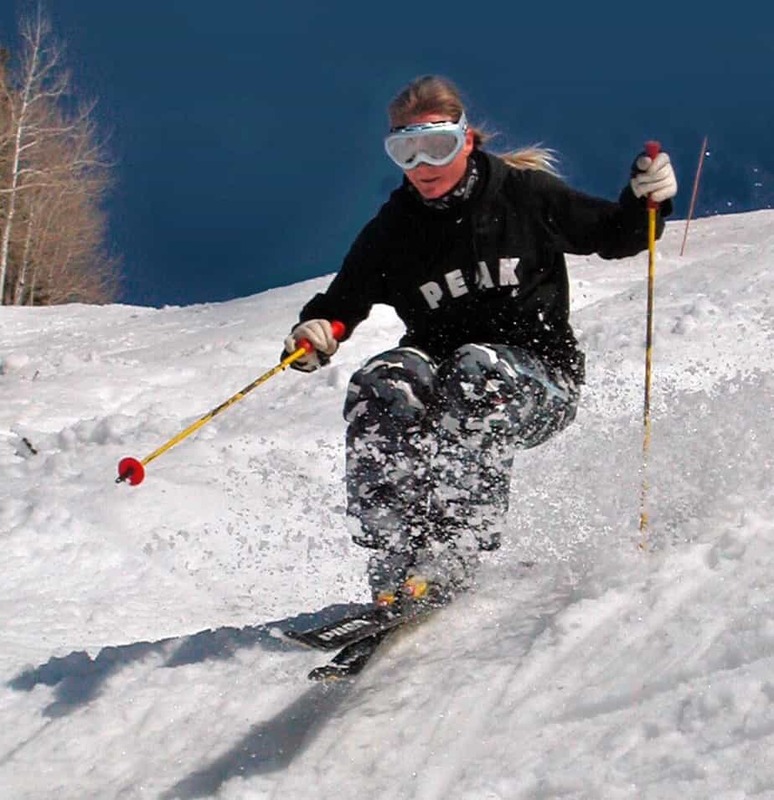 Moguls skiing is amateur sports, so funding means a lot. But I knew it was the right thing to do if I wanted to get back to the top of the world cup. In Canada I was introduced to some very competent people and to words like biomechanics, muscle recruitment patterns, muscular imbalances and to treatments like Active Release Techniques®. If I had known what I know today about biomechanics and movement patterns, I could have anticipated and made the changes ahead of time. I would have changed my conditioning, so that it would have never become an issue. I would have rebalanced myself with the proper training. As I did later. Once I knew. I can’t say that I would have won the gold medal, but I’m convinced that I could have avoided the herniated discs and a whole lot of pain. After my stay in Toronto, I came back with good, balanced mechanics to season start and finished 2nd at the first world cup. At the bext world cup, I tore my ACL in a crash…! Back to the clinics, hospitals, rehab, treatments etc. Now I had to regain good mechanics of the knee and make sure I didn’t mess up at the lumbar level again in the meantime. I did all my rehab training 4-5 hours a day. 10 months later, as I was just getting ready to hit the moguls again, I had to go back on the table and have most my meniscus removed. The surgeon had tried to repair my meniscal tear, but it didn’t work. This meant that I was no longer on time for season start. The prequalifying season for the 2002 Olympics.The knee now got most of the attention and I slowly slipped into my bad compensation habits, that had caused me the back injury. At World Championships in Whistler 2001 I was in immense back pain again.I cried on the lift between training runs. From pain and from fear. Was this going to be the end of my skiing career? This time I went to Vermont to train with Bill Knowles. I had heard he was a good trainer and that he understood moguls skiing. At the same time, I tried to instruct my boyfriend back then to the best of my knowledge in a few moves of a specific type of treatment that I had tried in Canada: Active Release Techniques®. It is by far the most efficient type of manual therapy I know of. He clearly had talent for it and it really helped me a lot. The training and the treatments were a great cocktail and we managed to get me ready for season start. My coach and I didn’t want to repeat the ignorance of the past. We bet our last chances of pre-qualifying, by ending the season right after Worlds, so that I could refocus on getting the mechanics right again rather than just focusing on the next competition. 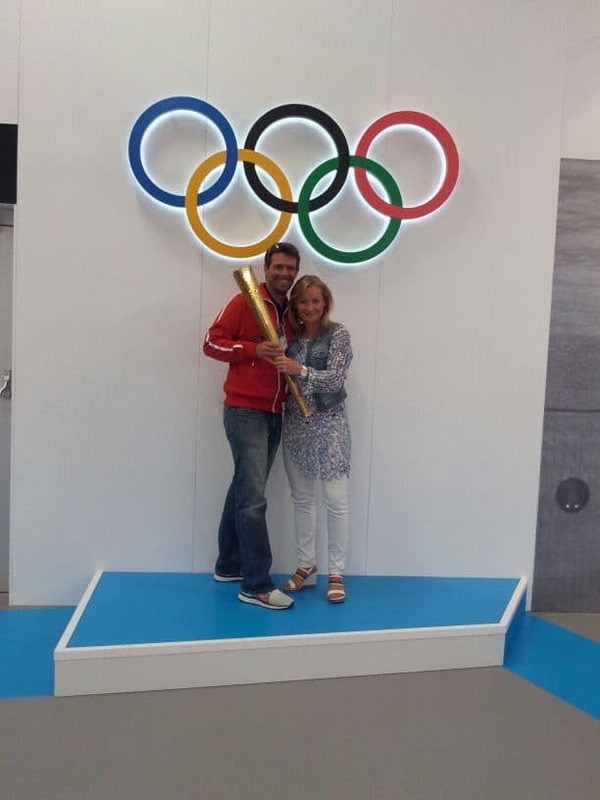 The bet was that with a healthy body, I would qualify for the Olympics at the first world cups of the Olympic season. That bet finally did cost me my funding. But again, I knew it was the right thing to do. and I was back in the game and fully funded again with top ten results. Together we had broken the viscous cycle and I was pain free!!! But, I had lost terrain during these injury years. I finished 15 at the 2002 Olympics. After the Olympics I decided to go back to basics and change some fundamental things in my skiing. Both the moguls courses and the skis had changed and the technique needed to follow. As for the jumps, the rules were changing and I had to learn new tricks.I had gone from one of the better jumpers to one of the worst during the 4 years of injuries. Fortunately I had already tried being at the bottom of the field, so I knew about the humility it was going to take to climb up the ladder. to get to a level where I could ski and jump at level with the top 10 of the field. This time I felt certain it would be the right time. In 2004 I had taken a year off from the world cup to just train and concentrate on the changes I still needed to make in order to catch up and ski with flow and confidence (On the side I took advantage finally finished the last bit of university that year…). where I had to put it all together and pre-qualify for the 2006 Olympics in Turin. I was so ready when it was finally time for the first world cup of the season 2005. This is a video from one of the last training sessions leading up to the season. I knew, I was on the right path to my third Olympics in 2006 and right on schedule. This time with a good, strong, healthy body. Finally! This feeling was broken in a split second about one hour into training. I landed a jump with one foot on an ice chunk, the size of a football. The ice chunk started rolling under my right foot and I couldn’t get off of it. It pulled my leg all the way out to the side until I heard the infamous “pop” of an ACL tear. In one instant the whole season is gone. Before it even started. That’s when you start getting fatalistic – at least for a little while. I guess it just isn’t meant to be. But I decided to give it one last chance. I did the surgery and the rehab to the best of my knowledge and experience (of which I had quite a bit by now). Things went well and I made good progress. By the time I got back on snow, my knee was strong and stable and I could ski. But it just wouldn’t accept the many hours of training that you need to be able to ski at world cup level. I had to accept that I had come to the end of that adventure. A great one that I don’t regret one bit. and enjoyed time in Mexico, among other things, creating a video with fitness training on the outdoor trampoline and being on the Danish Survivor show with Danish athletes from all different kinds of sports as well as creating the Get Fit To Hit The Slopes ski fitness video. I always kept on top of my conditioning because I knew I had to if I didn’t want to feel limited. 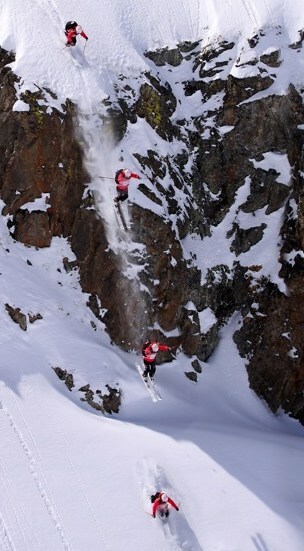 I recycled my skiing skills in to a second career in freeride skiing. It was a weird coincidence but I can thank training for being able to grab this opportunity. It gave me a chance to finish some unfinished business on the snow. In the season of 2010 I managed to win the Roeldal Freeride Challenge in Norway on a wild card earned by the winning the Danish Nationals and including the drop on the picture to the right. Winning in Roeldal qualified me to compete on the Freeride World Tour in 2011. You cannot believe how good that made me feel! I was turning 40 that year! how much we can influence our bodies through training. That’s why I work with this today. I love helping dedicated people get tuned for the sport or lifestyle they want to excel at and see the results and satisfaction it brings. it is my turn to be the guide. I strive to inspire people to nurture their strength, health and well-being whether for performance, prevention or pleasure. To me that’s the essence of training. Training is how we help destiny decide what we are capable of doing. Training is what allowed me the adventure to this mountain top as a pro skier despite my nationality and upbringing in a country where the highest peak is 200 meters! 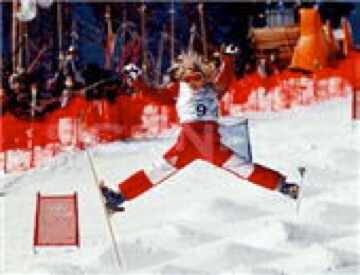 Was leading the world cup as the first and only ever Danish skier one month before the Nagano Olympics 1998. Then herniated a disc. 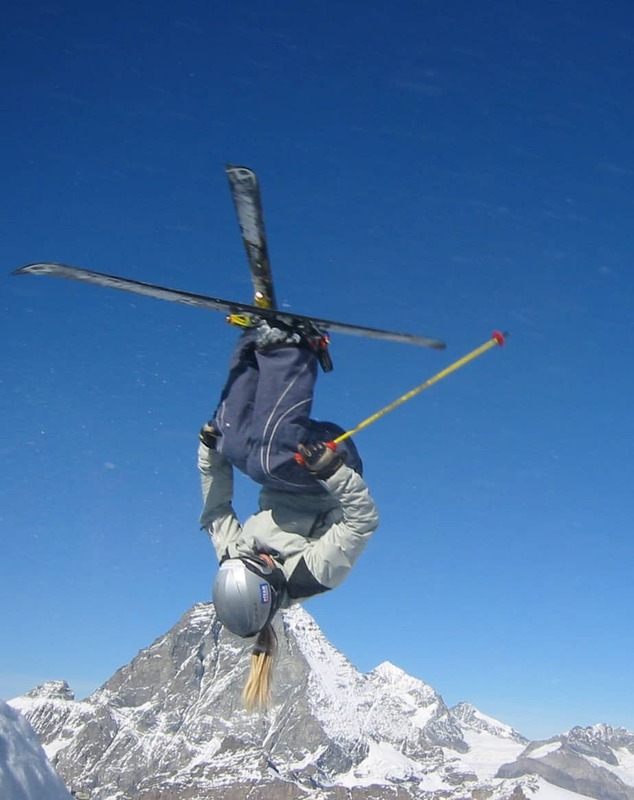 Has had ski fitness articles published in magazines and newspapers every fall since 2006. Returned to competitive skiing after 5 years off and was in the top 10 of the Freeride World Tour at the age of 40, thanks to her conditioning. Has come back from ACL reconstructive surgery on each knee 5 years apart. Has come back after herniated discs. Went from being the outsider from a country without skiing, mountains nor financial support to being a world class skier with two careers, one as a moguls skier and one on the Freeride World Tour. Loves dancing and outdoor sports.